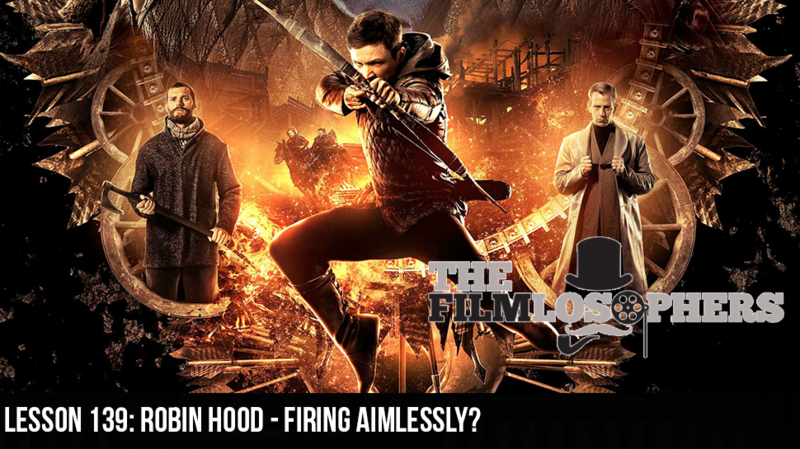 Lesson 139: Robin Hood – Firing Aimlessly? The Filmlosophers, Eddie Villanueva, Chad Riley and Spencer Williams, feel like they’re stealing from the poor with this week’s review of box office bomb Robin Hood (2018). Directed by Otto Bathurst, this latest retelling of the exploits of the popular English archer stars Taron Egerton, Jamie Foxx, Ben Mendelsohn, Eve Hewson, Tim Minchin, and Jamie Dornan. Given the film’s poor reception during its first weekend in theaters, it’s unlikely to inspire a sequel…but was the action-oriented story all that bad? We break down the good, the bad and the downright unintelligent, while also drawing comparisons to similar projects from years past – Ridley Scott’s Robin Hood (2010) starring Russell Crowe and Cate Blanchett, Kevin Costner’s Robin Hood Prince of Thieves (1991), and beloved spoof film Robin Hood Men in Tights (1993) starring Cary Elwes.